Mahindra Reva will launch the Verito Electric in the middle of 2015. With the first electric sedan in India, Mahindra Reva is taking an all new approach towards selling cars. Instead of positioning the Verito Electric sedan as a vehicle for family car buyers, the electric vehicle maker will pitch the car to rental fleets, particularly the self drive segment that is currently seeing a great response in India. Mahindra Reva has already inducted the E2O as an affordable self drive car with rental fleets such as Zoom and Carzonrent. The E2O is the least priced self drive car available in India with 8 hour rentals starting from as low as 400 rupees. The low rentals are mainly driven by the low running and maintenance cost that the electric car brings to the table. The electric car vehicle maker is working on a similar strategy for the Verito Electric, which was showcased at consecutive Auto Expos in India. The Verito Electric uses a 39 Bhp electric motor powered by lithium ion batteries. The car gets a range of 100 kilometers for one full charge, with top speed rated at 85 Kph. A CVT automatic gearbox handles torque transmission to the front wheels of the car. 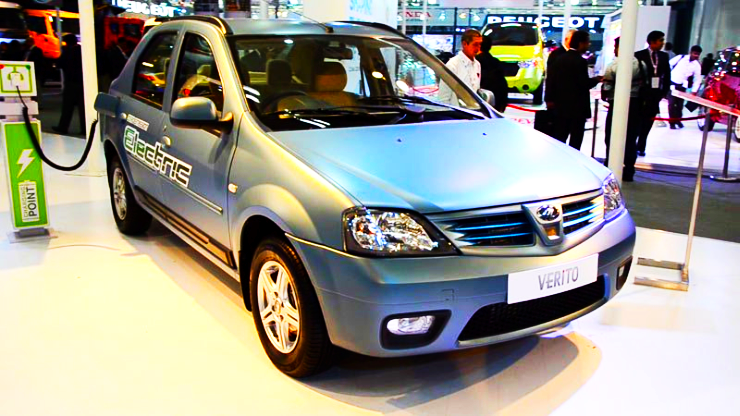 The Verito Electric, like its internal combustion engine powered siblings, is a badge engineered Renault/Dacia Logan. The car comes with a wide body design to fit in five adults comfortably. In terms of pricing, the Verito Electric is likely to cost about 10 lakh rupees in India, making it more expensive than many C-Segment sedans powered by petrol and diesel. This is one reason why Mahindra will want to focus more on the self drive cab segment, which can stomach the higher initial costs in favour of better realizations in the long term. If the Indian government doles out attractive subsidies to the Verito Electric through the NEMMP 2020, the car could end up with an attractive price tag that even allures family car buyers, who could be quite taken by the low running costs and high dose of practical-ness.